Our geese make fantastic alternatives to Christmas turkeys and give off rich and succulent flavors, complementing any festive spread. The flock is raised to the highest welfare standards, enjoying a life of freedom on top of the Somerset hills. Their diet consists of all natural wheat and barley grown on our farm, as well as what they can forage from amongst the grass and hedge rows. The geese are processed onsite, game hung for approximately 10-14 days then hand prepared in time for Christmas so that all you have to do is enjoy! Why choose Castlemead over supermarket geese? At Castlemead we have full traceability over our birds; everything is completed here on the farm, from day one to when your bird is oven ready. We have our own facilities onsite meaning that not once do the geese get loaded onto lorries and shipped all over the country, then processed in a factory. Our birds are processed and reared by hand; it's the only way to ensure the best quality. 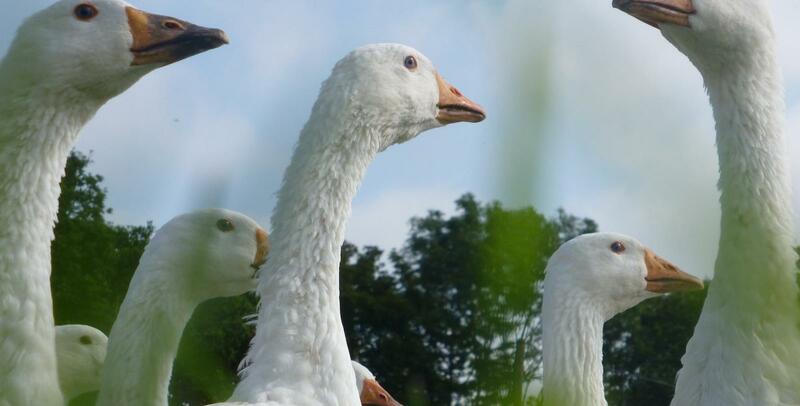 Our geese are six months old when they reach maturity, providing a moist, fatty and soft texture for your Christmas goose. We dry pluck them for a great crispy skin and hand prepare them for your convenience. Here are out top tips to cooking the perfect Castlemead goose. Prepping your bird: Use a sharp knife to score the breast and leg skin in a criss-cross, this helps the fat to render down during roasting. TOP TIP To give the bird a golden skin, brown it in a large frying pan using a couple of tablespoons of oil. Cooking time: Cook for 10 minutes at 240c/220c fan/gas 9, then reduce to 190c/170c fan/gas 5 and cook for a further 20 minutes per kilogram for medium-rare, or 32 minutes for per kilogram for well-done. TOP TIP Every 30 minutes, baste the bird with the juices, then pour off the fat (you can keep the fat for deliciously crisp roast potatoes). TOP TIP Leave to rest for 30 minutes covered in foil before serving for a moist meat that is easy to carve.